Women and girls in the garment industry are often subject to forced overtime and low wages, and on domestic workers because of the unprotected nature of their work. The United Nations human rights office today launched a joint report with the African Union and UN Women detailing the progress and challenges to women’s struggle for human rights in Africa, while the UN rights chief warned that the women’s movement around the world is facing a backlash that hurts both men and women. “Human rights are not a utopian fairy-tale -they are a recipe for sound institutions, more sustainable development and greater peace,” Mr. Zeid wrote in the Foreword to the report. 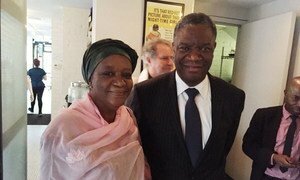 The United Nations office working to end conflict-related sexual violence helped to bring world-renowned surgeon Denis Mukwege and a team from his Panzi Hospital to Conakry, Guinea, to provide medical and psychological treatment for 30 of the women and girls raped in politically-motivated violence in 2009, it was announced today.